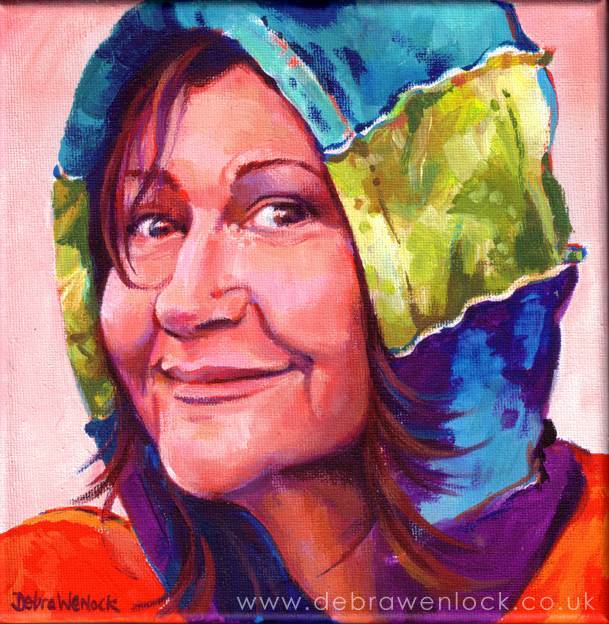 Debra Wenlock is a colour-passionate artist. 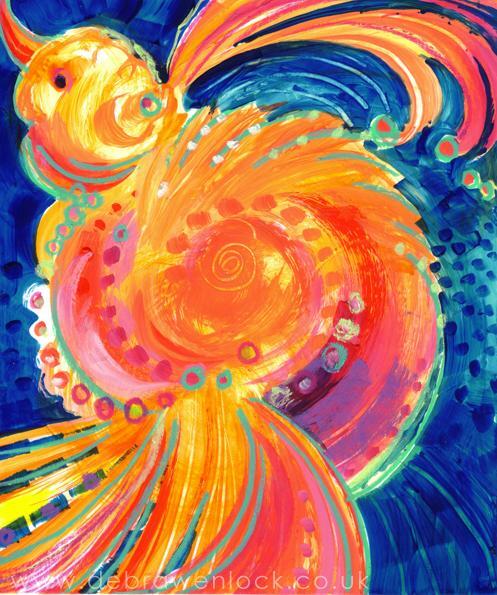 Her joyful paintings bring light and colour to lift your spirits! 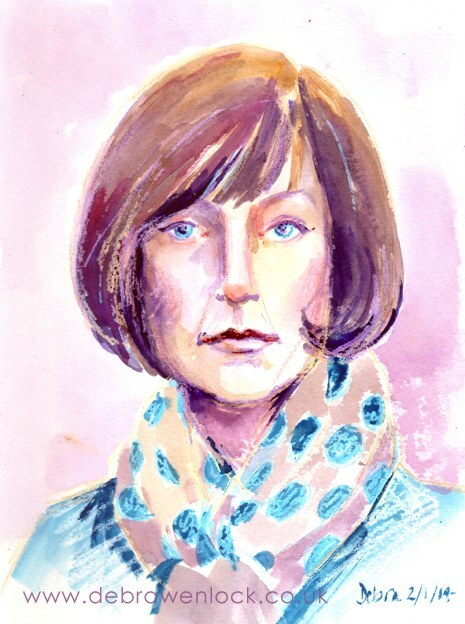 I did mean to make my Daily Face a quick sketch, but somehow was lured by the paints. This one’s from a photo of my friend Nem, who lives in Austria, taken the last time she and her family visited Northern Ireland. 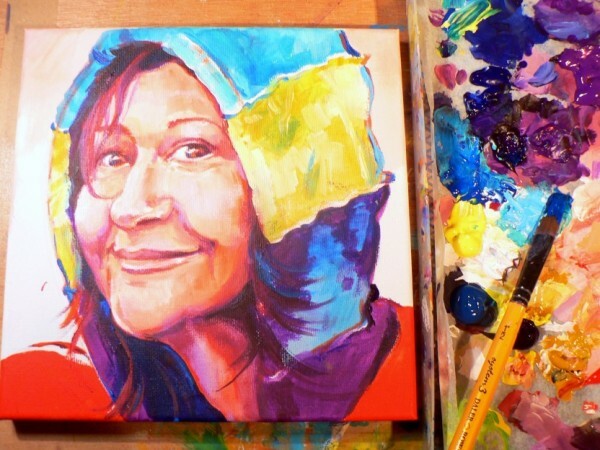 I love the colourful hoody she wore that day and her expression was priceless. I hope she’ll forgive me for zooming in! Sketched loosely with red watercolour pencil on canvas, followed by scarlet acrylic to define the outline and shadows. 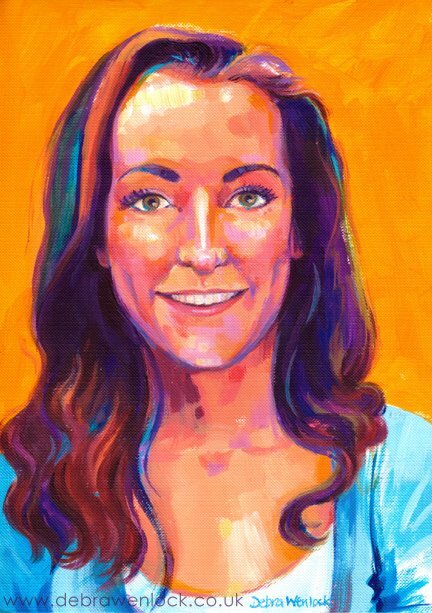 I try to keep the colours fairly clean and fresh to start with, working through to some subtler and more natual tones to complete the portrait. Too tired to finish this evening, I’ll restart and finish with a blast of enthusiasm in the morning. And here’s the finished portrait! Amazing Face – Here’s… Grace! I’m giving Grace a little guidance with her art studies at the moment and am so pleased that she agreed to pose for my daily face project. I took the opportunity to make a couple of contrasting portraits. 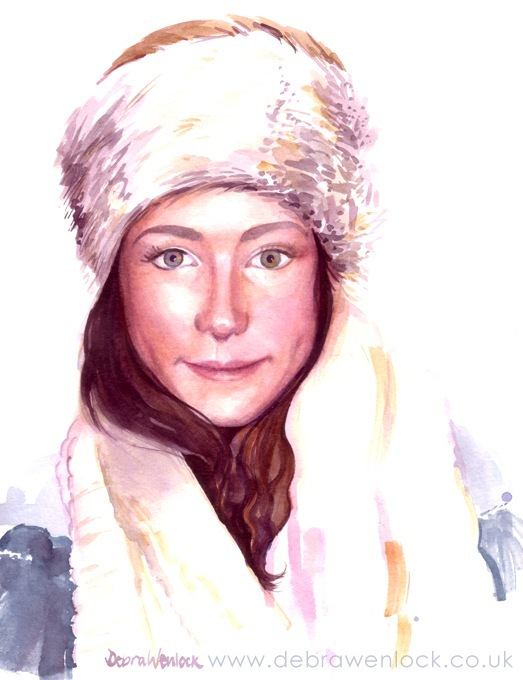 One in colourful acrylic, the other a soft watercolour, inspired by the soft texture & colours of Grace’s fur headband! 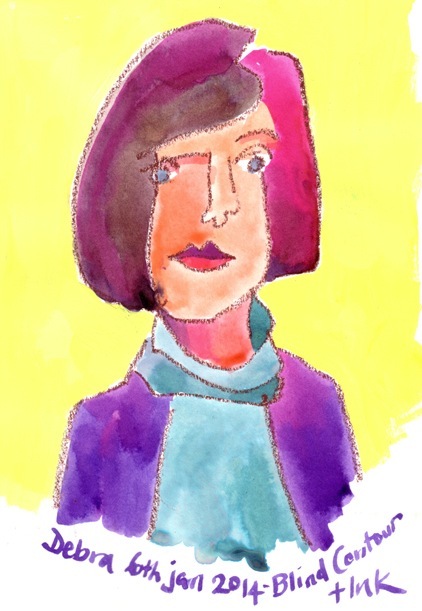 Sketched in oil pastel and coloured with gouache… An unusual pairing of media, but I like to experiment. 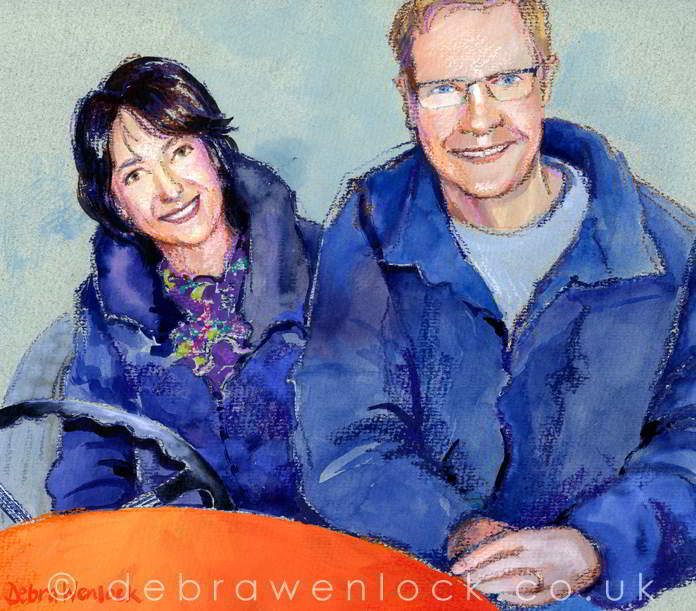 Eventually the car itself was painted orange, which gave me licence to add some complementary colour to this portrait and a glimmer of a glow to the faces – I think it worked well! Our friend Martin called round to loan us some old photographs to scan for a book project and was recruited to be photographed for portrait reference images. He obliged most graciously even stricking a pose when I suggested that I hoped to put as much fun into my project as possible. A little more tricky to capture than a straightforward view – but I’m pleased with the outcome – and I think I have achieved a likeness! When drawing on a mid-toned ground I usually start by picking out the highlights in the image – this time the hair and highlights on the brow, cheeks and nose, before investigating features and the darkest areas of shadow… Then comes the colour and finally a few refinements. The best part is when I start to recognise the character – and hopefully I have locked a little Martin glee into this piece! 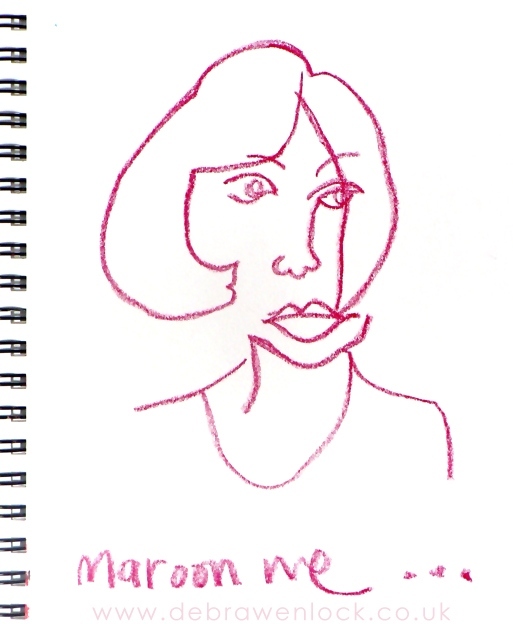 This time a couple of “blind contour” selfies! I came across this little ink sketch yesterday and remembered how much I enjoyed the unpredictability of making these drawings and decided that I’d make one to colour-in! I’ll have to own up to just a wee bit of cheating, having made a couple of non-focused glances at the page to reposition my oil pastel. Some wonderfully Picassoesque results can be stumbled upon using this method (without the furtive glances) and it’s a great fun way to loosen up to portraiture! I do these as a limbering or loosening up excercise… they are always of me – for my sanity and amusement. An attempt to escape my perfectionist tendencies for a while. A fun way out of an artistic rut maybe or a way past blank page paralysis! I’m sharing the kind of stuff you wouldn’t usually get to see – celebrating the wonky wonders of creativity. Not all art is born perfect. This self portrait sketch had a time limit… loosely though, I can’t be too hard on myself… within an hour. I think I managed it in 40, maybe 45, minutes. Sitting on a cushion on the floor in front of the mirror wasn’t the most comfortable and helped speed things up rather well! There’s a mini secret here that I wasn’t even looking for – if I get stuck or slow up – move, change position, get out of the comfort zone. 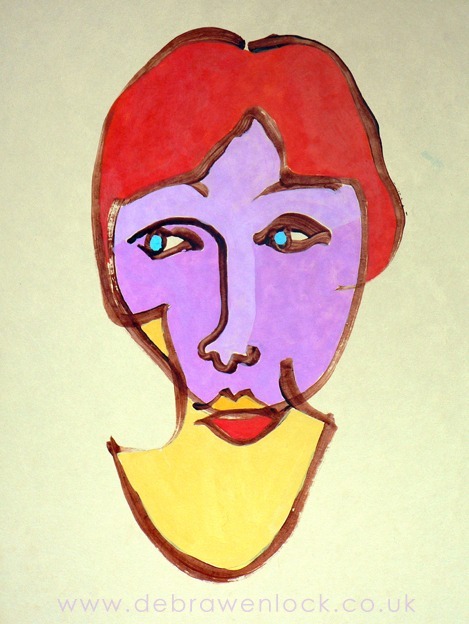 Working with wax crayons and watercolour is one of my favorite mediums. 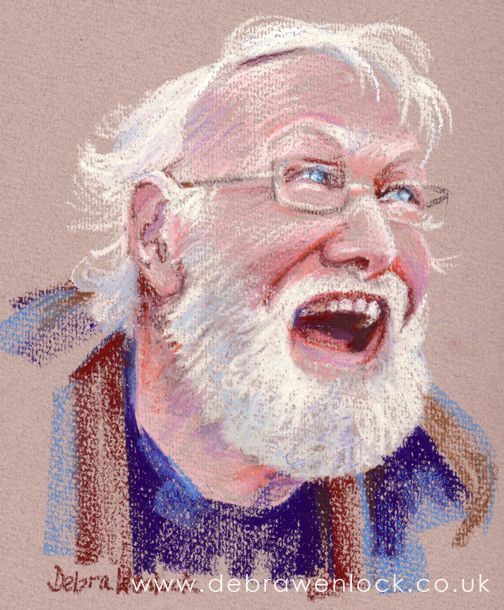 I sketch with the crayons, often choosing contrasting colours that burst gleefully through the fluid paint as it is applied fairly loosely over the initial drawing. In lieu of New Year’s Resolutions I decided that I would choose something that I’d like to be painting, and stick to doing that every day for at least a month, far more productive potentially than invariably short-lived resolutions. As I’m intrigued by faces and love portraiture it’s going to be faces… Again, I don’t want to restrict myself at all and would like this project to evolve at it’s own pace. 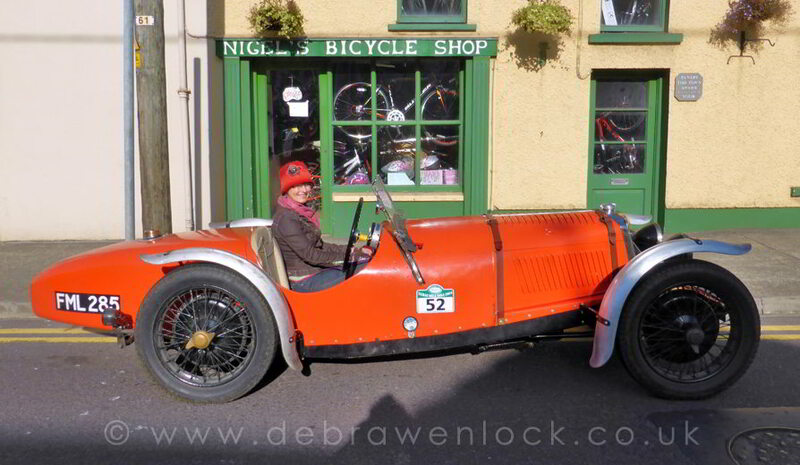 I have already put out a call for volunteers as it would be great to meet some new faces along the way. 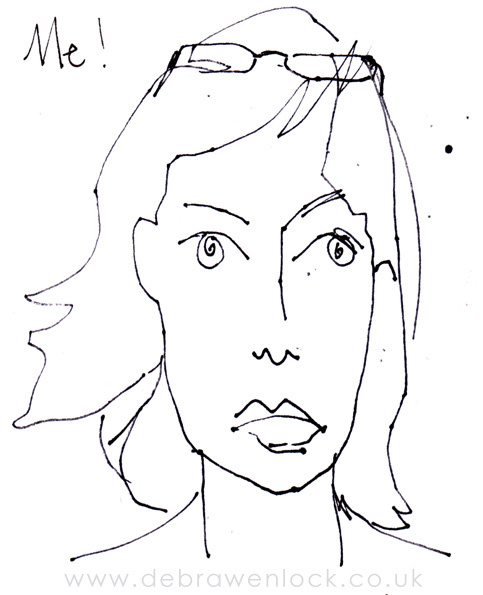 So if you are feeling bold, I’d love to see some of your facial expressions – send me your mug-shot… inspire me! I do know that I don’t want to get too serious or to be taking formal commissions – for this project at least – let me show you what I can do. 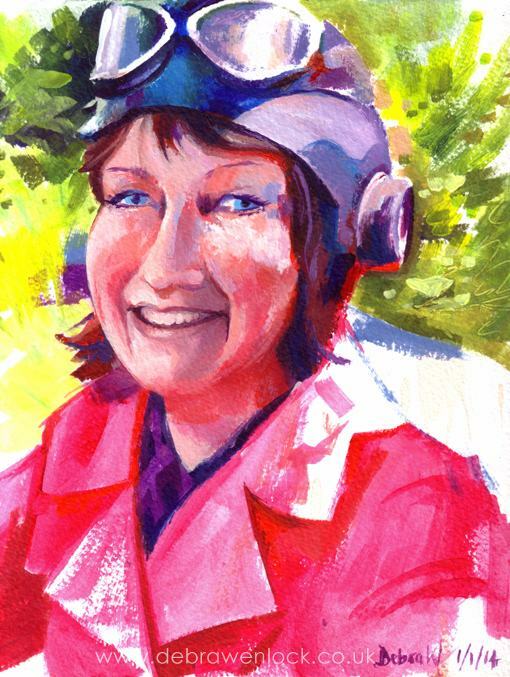 I’d like to have some freedom for fun as well as looking for likenesses and mess about with different media. 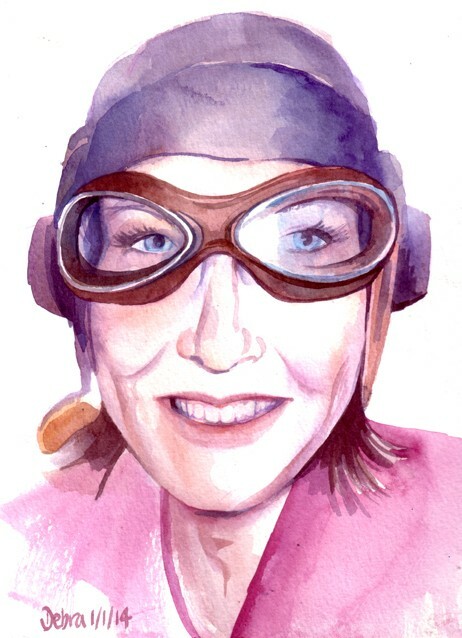 To set the tone a little with my first couple of paintings, I threw vanity to the wind and painted myself – complete with flying hat and goggles. Over Christmas I’m trying to keep up daily painting without slaving away at the easel, so these lovelies are what’s emerging from my playful paint brush. They don’t originate fully formed in my imagination but rather evolve at warp-factor speed – my imagination working intuitively alongside a speedy brush. 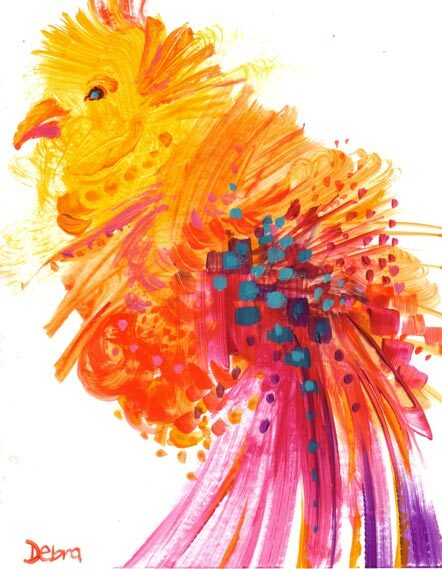 If you’re interested to see more colourful bird paintings – please click here. 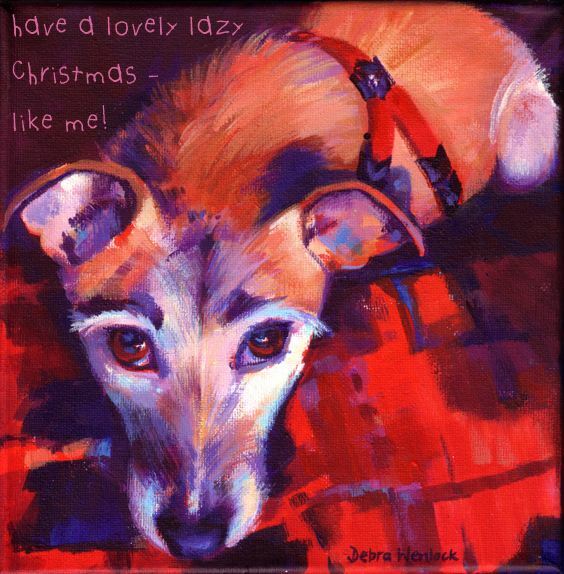 Dog Portrait – Who’s “Naughty or Nice” this Christmas? Daily paintings for advent – 24rd December 2013. Here’s Pip, and this is how she likes to spend her mornings – lazing on my tartan blanket… and doesn’t she look cozy? She is very well behaved – and yet, there is definitely something mischievous in those eyes! We’ll soon find out whether she’s been “nice” enough for Santa! 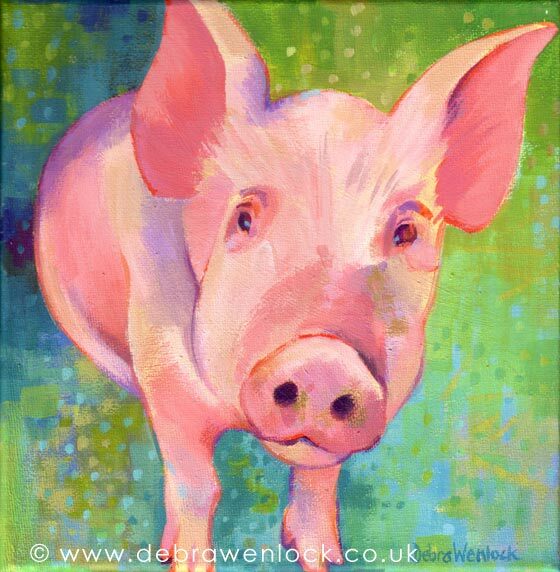 This is my last post for advent 2013 – but I will continue to paint and share the animals in my life! I hope you have enjoyed the series – and I would love to hear from you if you have any suggestions or comments. 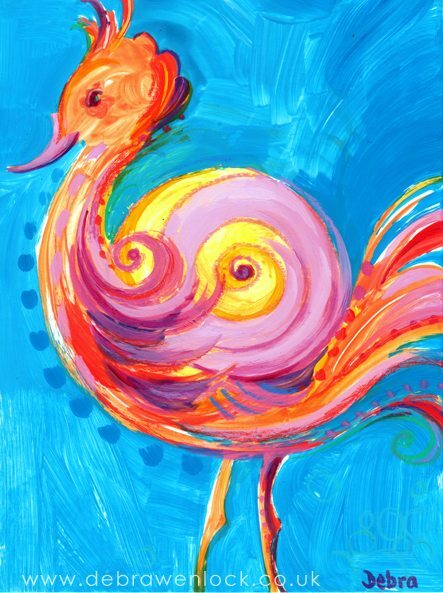 Daily paintings for advent – 23rd December 2013. Ulster Folk Museum piglets follow their mother in pursuit of food – and later a little piggy looks happily satisfied after his munch. These two paintings just seem to belong together. 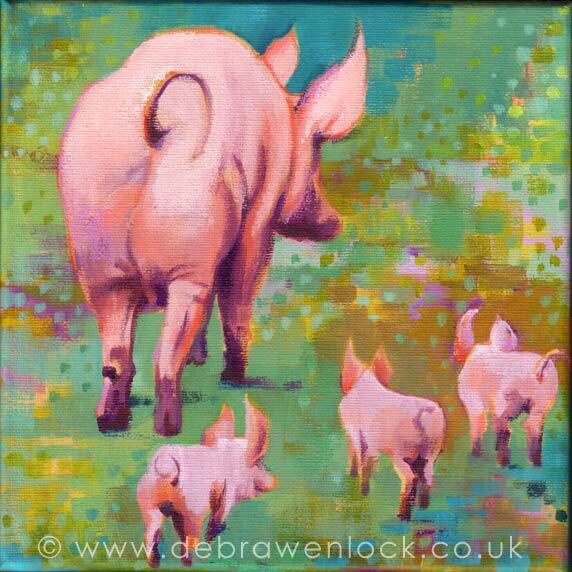 Original pig paintings in acrylic on canvas, each measuring 8 x 8 inches. View or Buy “Pigs in Pursuit” or “Peppermint Pig” at my Gallery Shop!